It started with one voice breaking the silence, left tackle Donald Penn saying to no one in particular what he'd just witnessed was in no way an example of what the Tampa Bay Buccaneers call "Bucs ball." By the time halftime came to a close, the only voice anyone in the Bucs locker room heard belonged to the man who mattered most, and it didn't seem to matter that he'd started rambling a bit. 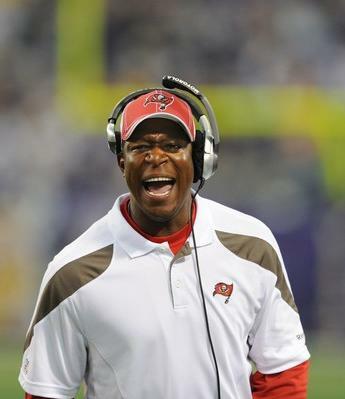 "He just kept saying, ‘We're going to win,"' Bucs cornerback Ronde Barber said of coach Raheem Morris' halftime address. "He must have said the word win 20 times. But he was emphatic, and when he's emphatic guys respond." They sure did. After turning in what Morris said was "arguably" their worst half of play since he became head coach in 2009, the Bucs turned in one of their best halves to pull out a stunning 24-20 victory against the Vikings on Sunday at Mall of America Field. The Bucs improved to 1-1 and Barber trotted into a postgame locker room that filled with whoops and hollers, the sounds of a team that had just overcome a 17-0 deficit to save its season. If that seems like a stretch, consider only one of the 14 Tampa Bay teams to start a season 0-2 reached the playoffs, the one that went 5-4 during the strike-shortened 1982 season. "We've seen 0-2 teams make runs before, but from a psychological standpoint, 1-1 looks a whole lot better on your scorecard," Barber said. "Especially when it has you on top of your division. And that's what (Morris) wanted. That was one of his big messages to us this week: ‘Win this game and stay in front in the NFC South.' That's going to be his message all year." The Bucs have a chance to stay in front if they play the way they did in the second half against the Vikings, who took advantage of another slow Bucs start to build a 17-0 halftime lead. 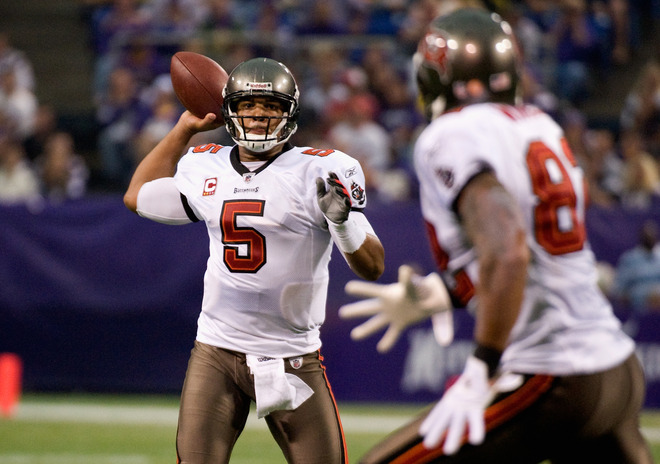 Led by quarterback Josh Freeman, who engineered his eighth fourth-quarter/overtime comeback victory in 27 NFL starts, the Bucs scored on four of five second-half possessions, including three touchdowns. Even the drive that failed to produce a score had benefits. Though it ended with Freeman being intercepted in the end zone, it started with a play that gave the Bucs the momentum they needed. "It surprised all of us," defensive tackle Gerald McCoy said of the decision to follow the first score with an onside kick, which the Bucs recovered. "But that's coach being coach." Coach was coach during halftime, as well. He "reamed" his defense "pretty good" for their first-half shortcomings, according to safety Cody Grimm, but delivered a tangible message. "All he really said was, ‘Do your job,'" Grimm said. "We didn't change a whole lot. We didn't make a lot of adjustments. The second half was really just a matter of us playing better." It was actually a matter of tackling better. The Bucs went into the game with a plan to gang-tackle Vikings running back Adrian Peterson, but too many solo efforts allowed Peterson to produce 86 first-half yards and two touchdowns. The second half started differently, as Peterson was stopped by defensive tackle Gerald McCoy for a 1-yard gain on his first play. Two plays later the Bucs had the ball back and the comeback was in bloom. Morris had a big hand in that, too. Unlike last week, when he cranked up the two-minute offense at the start of the third quarter, Morris told offensive coordinator Greg Olson to stick to his original game plan. That meant giving the ball to running back LeGarrette Blount, running play-action fakes to Blount and throwing quickly to a variety of receiving targets to keep the Vikings off balance. The strategy worked, especially the part involving Blount. After gaining just 4 yards on five first-half carries, Blount ran behind linemen Davin Joseph and Jeremy Trueblood for 27 yards and a touchdown on his first carry of the second half. He gained 13 more on the first play after the recovered onside kick, and with the Vikings suddenly keying on him, Freeman took advantage to complete 15 of 20 second-half passes for 191 yards and a touchdown. "We came out and got LeGarrette rolling, and in the passing game, guys were making plays left and right," said Freeman, whose got his 14th career victory as a starter. We knew that all we needed to do was put some points on the board and get it back to being a two-possession game and that we would be in pretty good shape from there if we did that." The defense is what kept them in good shape. It allowed just 114 yards and one field goal in the second half. In the end, though, everyone knew it was Freeman who had saved their once-sinking ship. "It was like we were the Titanic and we'd hit a glacier," Penn said. "But Josh is the captain of the boat. Because of him, we ride on, and we won't be dropping anchor anytime soon."